OUR GOAL is to have you to RETHINK ordinary waste by learning about Ada County Landfill’s waste management. Effective waste management depends on user knowledge and participation. Determination of what is ordinary waste starts with you. Ada County Landfill’s recycling, waste diversion, and reuse programs curb what is buried as ordinary waste. Your participation will extend the life of the Ada County Landfill and protect the environment. This program is free to Ada County residents (incorporated and unincorporated areas) and is sponsored by Ada County, Boise City Public Works, Republic Services and PSC Environmental Services. 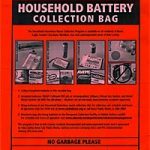 Battery Bags are available at the Mobile Collection sites and at the Household Hazardous Waste Facility on Fridays and Saturdays. The Household Hazardous Waste Material Collection Program is available to all residents of Boise, Eagle, Garden City, Kuna, Meridian, Star and unincorporated areas of Ada County. Small quantity business generators should contact the Household Hazardous Waste Facility to determine costs. With new rules for recycling please take note of the new guidance references. WHEN IN DOUBT; THROW IT OUT! If you are unsure of what can go in the bins it is best to simply throw the item in your garbage can. Empty cans must be rinsed; labels may remain on cans. Aerosol cans must be empty. Pesticide and chemical cans are prohibited curbside but can be disposed of at any household hazardous material mobile collection site. White or pastel paper, non-corrugated boxes (paperboard) with liners removed, cereal and frozen food boxes with liners removed, phonebooks, envelopes with or without windows, paper bags, wrapping paper (no foil), school papers (without glitter/glue), and junk mail. A neon colored paper is not accepted. No filmy plastic, grocery bags, vinyl, or Styrofoam will be accepted. For City of Meridian residents and Republic Services customers: Break boxes down to no larger than 2′ x 2′ and placed under or next to the bin. WHAT DOES NOT GO IN THE BIN? Aluminum (tin) foil has a different makeup than aluminum cans. As with incompatible plastics, incompatible aluminum fouls the recycling process. Pizza boxes and foil-lined food containers. Because of the sticky food residue, these items cannot be recycled. They gum up the recycling equipment. Paperboard milk cartons or juice cartons. Any paperboard container that has a wax coating cannot be recycled. Like sticky food residue, wax can damage the recycling equipment. As a waste diversion tactic, curbside SINGLE-STREAM recycling is both popular and effective. Every single family residence in Ada County is eligible to participate in the curbside recycling program. This program is supplemented by vast amounts of recyclable materials that are taken directly to the area’s recycling centers by people and businesses in Ada County. The better you understand “What is Waste?” the better you can help curb what is a waste at your curbside. Ada County curbed 1.1 million yards of waste in 2012. SINGLE-STREAM recycling eliminates the need to place your recyclable materials in separate bags or bins. Computer monitors and TVs in the recycling area of the Ada County Landfill. Though televisions and computer monitors qualify as E-Waste they are their own item. 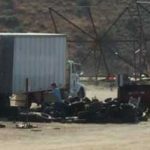 Bring your televisions and computer monitors to the Ada County Landfill (regular hours Monday-Saturday) and they will be processed separately since they contain lead. There is no limit to the number of items that can be recycled, however, an appointment must be made if there are more than ten. Electronics are manufactured with many materials that are recyclable. 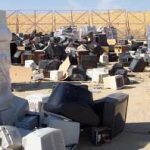 The Ada County Landfill Recycling Center accepts unwanted electronics. 40,915 units of E-Waste was diverted from landfill ordinary waste in 2012. Through FY 2013, 12,456,766 pounds of CRTS have been accepted and sent out. Older televisions and computer monitors contain as much as 8 pounds of lead! In this region, recycling glass is problematic. We are long distances from resources that use glass in their manufacturing processes. Because glass is heavy, transportation costs remove profitability in glass recycling. This is one of the major factors causing glass to be listed as an unacceptable item in the curbside recycling bins. Glass is a recyclable commodity in the right environment. Boise City residents may recycle glass through the cooperative efforts of the City of Boise, the Ada County Highway District, and Republic Services. However, it does not involve your curbside recycling bin or your trash can. It does involve a little effort on your part. Any lawn mower will work, but a mulching mower works best. Don’t remove more than 1 inch or 1/3 of the grass blade. Removing too much reduces nutrient reserves, causing stress and browning. Keep mower blades sharp. Sharp blades cut the clippings into smaller pieces. This also provides a cleaner cut and prevents tearing and browning the grass tips. Mow frequently. By frequently, this means every 5 to 6 days or 5 times a month during the growing season. This increases grass shoot density which inhibits weed growth. Although you may be mowing more often, by not bagging the clippings, you are still saving time. Try not to mow when the grass is too wet. Wet grass clumps and does not scatter easily. If you have clumps, trying mowing a second time to further break up the clumps or bag the clippings for compost or mulch. From April – October grass clippings can be recycled. Customers may subscribe to the optional paid service through Republic Services. Fertilize while the grass is actively growing (spring and fall). Fall fertilizing is important for developing strong root systems capable of supporting vigorous leaf growth. Use slow-release or water-insoluble fertilizer. Fertilizers that release nitrogen too quickly cause rapid leaf growth at the expense of healthy stem and root growth. Over-fertilizing can pose a threat to ground and surface water. Infrequent, long irrigation cycles promote deep root zones more capable of withstanding drought conditions. Water at night or early morning to reduce water loss to evaporation. Contrary to the myth, clippings do not promote thatch build up. Clippings break down quickly, often in a matter of a few weeks. Thatch is the build-up of roots and stems and is commonly the result of over-fertilizing and excessive watering. Grasscycling is the practice of leaving clippings on the lawn rather than throwing them away where they take up space in the landfill. Studies have shown that Grasscycling makes lawns greener and healthier. Grass clippings are a valuable source of nitrogen needed for healthy lawns. Saves time! Up to 35% of your lawn care time is spent emptying your mower bag, raking up clippings, bagging clippings and dragging them to the curb. Saves money since you don’t have to buy clipping bags, and you don’t have to fertilize or water your lawn as often. Shelters grass roots from the sun conserve moisture and reduce weeds and the incidences of certain lawn diseases. Creates a natural fertilizer. Grass clippings are 80% water. Once cut, the clippings wither, shrink and sift down to the ground. Microorganisms break down the clippings making the nutrients in the clippings available to the lawn. In the fall Ada County residents can bring their leaves to the landfill at no charge during a six-week period. Refer to Calendar for leaf recycling collection dates. Each November Republic Services, in partnership with the various municipalities of Ada County, provides for curbside leaf collection. Bring your metals to the Ada County Landfill Recycling Center where they will be separated and shipped to a local metals recycler. Ada County Landfill metals recycling area. 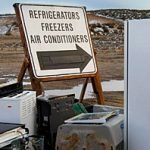 Bring your EMPTY refrigerator/freezer or your refrigeration units to the Ada County Landfill Recycling Center where qualified technicians will remove Freon from refrigeration units. The metal cases from the appliances are then shipped to a local metal recycler. The landfill can accept up to five gallons of used motor oil. Near the Landfill’s active recycling area, Ada County has a 500-gallon tank for used motor oil. The disadvantage to this option is that one must pour the oil from one’s container into the large tank. Take up to five gallons to the Household Hazardous Waste Facility on Fridays and Saturdays from 8:00 AM to 6:00 PM. Special conditions may apply if there are more than five gallons. The Household Hazardous Waste Facility will take more than five gallons of oil, however, questions may be asked to determine if a test needs to be performed. The cost of the test is $15. There is a $10 fee for disposing of a drum of oil. Republic Services can collect used motor oil curbside in Boise, Meridian, Unincorporated Ada County, Star, and Eagle. Residents should check with their local auto parts stores or other automotive service centers for additional recycling hubs. Take up to two gallons to the Household Hazardous Material Waste Facility open Fridays and Saturdays from 8:00 AM to 6:00 PM. 81,763 pounds of used motor oil was collected by the Ada County Household Hazardous Waste Facility and Mobile Collection in 2012. Oil disposal tank located at the Household Hazardous Waste Facility. One gallon of motor oil can foul the taste of 1,000,000 gallons of water. One pint of oil can cause an oil slick the size of two football fields on a lake. Approximately 42 gallons of crude oil is processed to make 2 1/2 quarts of motor oil. One gallon of refined used motor oil produces an equivalent 2 1/2 quarts of motor oil. The Ada County Landfill can accept up to four (4) passenger car size tires (18″ rim diameter or smaller). Tires delivered to the landfill are recycled through a privately owned company. 3,163 tires were diverted as ordinary waste from the Ada County Landfill in FY 2013 and 2,512 tires were diverted in FY 2012. Fencing and other wood materials waiting to be recycled. Basically, anything that can be turned into wood chips is acceptable in the wood recycling program at the Ada County Landfill. What About Nails and Other Fasteners? There is no need to remove nails, screws, hinges, or other metal fasteners (provided they are not large steel fasteners). Small fasteners pass through the grinding and screening equipment and are picked up by powerful magnets. The metals collected from the wood grinding process are shipped to a metals recycling company. After the holiday season, Ada County accepts Christmas trees at no charge. Refer to Calendar for free Christmas tree recycling dates. Christmas trees can be set out for collection depending on location. Refer to Calendar for free Christmas tree recycling dates. Wood, whether in its natural form, such as tree limbs, shrubs or bushes, or in a processed form, such as lumber, takes up considerable space in landfills. Ada County Landfill partners with a contractor to mulch wood for a variety of reuse purposes. 10,000 cubic yards of wood chips diverted at the landfill monthly.